Every time you open yourself to new possibilities, you open yourself to a shift in Consciousness. Shifts in Consciousness take place when you consider that what you thought was true may not be true at all. They also happen when you discover that what you thought was false may really be true after all. How courageous are you? Are you welcoming the shifts, or resisting them? Resistance is painful, and will not change the Truth. The Truth is that each and every one of us are going through a rapid evolution to become an enlightened being. Yes, it's really happening. The image at the top of this article illustrates it perfectly. We're in the process of moving from very dense consciousness to a lighter, brighter, more luminous consciousness. 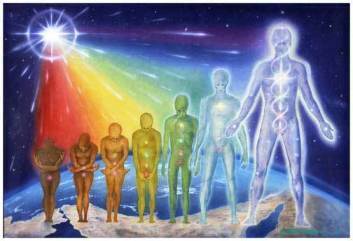 The same process is changing our physical bodies into crystalline bodies (from carbon based to silicon based) so we an carry more Light and more Love. In the denser realms where we have been living, we've allowed ourselves to fall into the traps of divisive thinking. We label everything and everyone, creating long lists of categories and shoving people into them. We think this is normal, but is it? At the highest spiritual levels, there's only Oneness, not an infinity of categories. The list goes on and on, and where does it take us? It makes everyone separate from everyone else. It closes our hearts, which are designed to be open, loving, and compassionate. It creates exclusion instead of inclusion. It causes pain and suffering, bullying, wars, and genocide. It takes courage to shift your consciousness to a new level of understanding. After all, at least for the moment, you won't be supported in this shift by the dominant paradigm. Most people are too distracted to open their hearts fully and notice the difference it can make to themselves and those around them. Most people are caught up in judgment. When our hearts are open, when we move into non-judgment, we discover that you and I are the same Consciousness. We're all ONE being at the level of Consciousness. Have you ever looked into someone else's eyes and realized that YOU are looking back at YOU? Next time you have an opportunity to do so, try this out. Look into someone else's eyes and recognize the Truth. "I Am You. You Are Me. We Are One." Consciousness Shifts. It's happening. Enjoy the ride! Better yet, make a conscious choice to fully integrate the shifts. That will not only make it easier for you: it will help others who are going through this process as well. Remember, ALL of humanity is shifting. How can we not be? We're all ONE.